I was walking through the hall a few weeks ago and saw my grade level partner hanging up snowflakes his kids made. "Good for him," I thought. We have a new math program (Singapore) that's good, but very difficult to transition into. So I thought it was great that he was taking a little break from it around the holidays since the kids just finished their first benchmark test. I stopped to read the sign on it. "Snowflake Geometry: See if you can find equilateral, scalene, and isosceles triangles, pentagons, rhombuses, and one other quadrilateral." My bulletin boards tend to be the same. They have the intention of getting kids to interact. But do they really? I decided I was going to use this as an opportunity to stretch as a teacher and make a truly interactive bulletin board, as well as use this as an excuse to collaborate with my new grade level partner, because we're both pretty shy and quiet. I made two sets of checklists. The first had everything he had on his checklist. And then the second had things that his omitted (for simplicity's sake). Things like right, acute, and obtuse angles, and parallel lines. Then I showed him the lists, and asked if he wanted to make this a whole fourth grade activity. 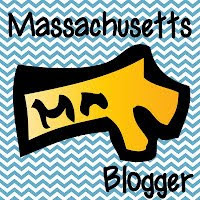 "My class could come by with clipboards, choose a snowflake, check off the items they see, and hang it up beside that snowflake. We'll make our own snowflakes, and then your class can do the same." His face lit up. It was ON. I had made snowflakes with my class before, and had them look for different things. But this time it was going to be more structured, so I had to make a model for myself of the different triangles. I had pre-taught a few children who finished their work early one day on how to cut out a basic 8 point triangle, so I had a "helper" at each group, and it went very successfully. After teaching the children all of the geometry terms they needed, they went back and cut the 5 required shapes out of their snowflakes and got to open them up and see the result. Next, I wanted them to have practice with analysis. I created a snowflake that had everything that was on Mr. E.'s checklist. 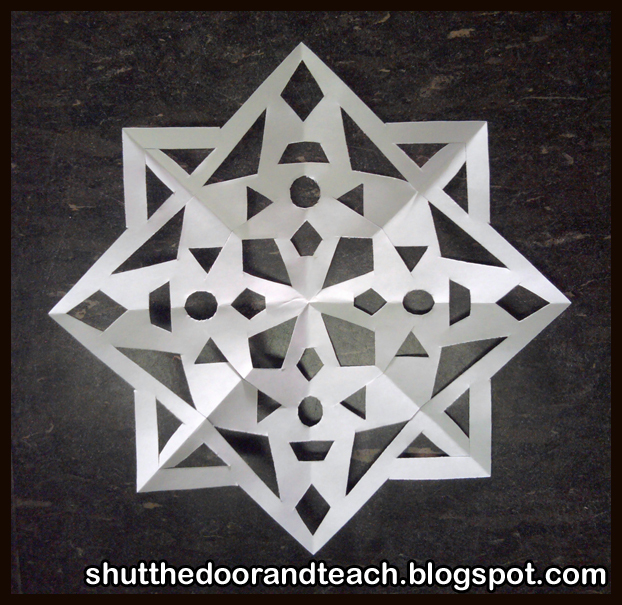 I created a template of the folded part so that I could trace it and create a total of 4 snowflakes; one for each of my groups. They were required to give the name and quantity of all the 2 dimensional figures that they could find. Anyone who finished early got to make a second snowflake. They were looking forward to this. When they had opened up their first snowflakes I asked them, "What do you like about it, and what would you change for next time?" Many said that they felt the pieces they cut out were too small. 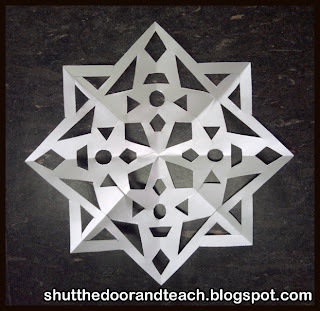 So I demonstrated on the board that when you are creating a snowflake, you want to pay just as much attention to the part you leave behind as the shapes you are cutting out. 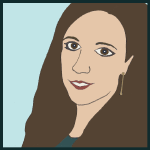 And that this is called the "negative space." Excited about the art lesson, they went to work and produced some of the best snowflakes my class has ever made! They were obviously excited about getting to leave things behind on the other class's board. And many of them whispered to each other excitedly, "They're here!" as the other class walked past our door with clipboards. These were truly interactive bulletin boards, and they learned a lot of geometry vocabulary through a variety of modalities: verbal, visual, and kinesthetic. 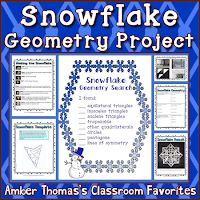 This Snowflake Geometry Project is available for less than $2 in my store.